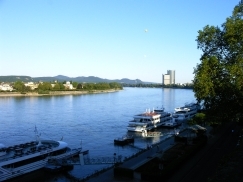 The ICRB 2006 will be held in the romantic Rhine valley near Bonn in the small spa Bad Honnef. Alexander v. Humboldt (1769-1859) called Bad Honnef the "Venice on the Rhine". He thought of the mild climate and the carefree Southern way of living of the inhabitants of the Rhineland. It is a pleasure for us to invite you to share the experience of Alexander v. Humboldt and bring your family with you. Bad Honnef is located at the foot of the legendary Sieben- gebirge, with its famous Drachenfels, and very close to the cities of Bonn and Cologne. The Siebengebirge is the gateway to the Rhine valley, which is well known for its pastoral scenery, ancient castles and half-timbered houses The Cologne/Bonn airport is only 30 minutes by car and the ICE train station in Siegburg, connecting Frankfurt airport to Bonn, is only 15 minutes by car or bus. Beginning at Bad Honnef, one can explore the Rhine valley with its scenic vineyards by ship. 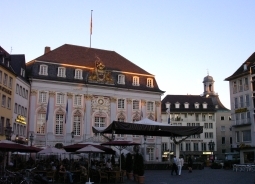 The Siebengebirge, Bonn (the former German capital), and Cologne, all offer a great variety of easily reached cultural opportunities. A trip to the Drachenburg, to the home of Konrad Adenauer, to Bonn (Museum of German History, Art Museum, Museum Alexander Koenig), the former district of the government with the Villa Hammerschmidt, to the beautiful Gothic cathedral in Cologne or a rivercruise to the Loreley are only some examples of possible activities. You may also walk in the footsteps of the Romans in the Rhine valley and Cologne, go wine tasting in the Siebengebirge or in the near river Ahr valley (both famous German wine regions), or you may visit the exhibition “ROOTS - Wurzeln der Menschheit”, an event which takes place in the Rheinische Landesmuseum of Bonn from July to November 2006. This exhibition celebrates the 150th anniversary of the finding of the first Neanderthal and will offer a complete overview of all the most important original finds from the field of hominid research in a powerful and unforgettable presentation. Two Hotels, a congressional hall and a wellness & beauty center make up the Seminaris Congress Park Bad Honnef. All facilities for the meeting including the art nouveau congress hall are located in the spa park with many niches for conversation in small or middle-sized groups while having a glass of wine or Kölsch. The accommodation in a first-class hotel comes with a generous wellness offer: Swimming pool, hot whirlpool, sauna and solariums guarantee relaxation. For those who never get tired there is a gym with workout equipment, table tennis, bowling lanes and bikes for hire. Outside the hotel, you can play boccia, walk in the spa garden or choose among the outdoor swimming pool, golf courses, tennis courts and paths for hiking, jogging and biking in the Siebengebirge. The hotel is also equipped with medical facilities.